makes a romantic boating trip safe. 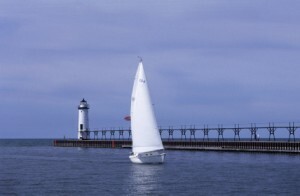 Lake Michigan marinas are a neccesity for a safe romantic venture on this big lake. If you are boating up and down the coast as many do, you need to know where you can stop off for gas, supplies or safe harbor. Many Michigan beach towns have public marinas with transient slips avaiable to reserve generally on a first come, first served basis. It's always best to call ahead to reserve your slip. Again, this is information you need to know if you are planning an extended Lake Michigan romantic cruise. Nothing can ruin that special getaway more than running into trouble and not knowing what to do or where to go for help. We want to help you find a marina on Lake Michigan that will meet all your needs. Michigan's west coast is busy during the summer season with boaters, fishermen and ferries. It's not unusual for folks to travel accross the lake from Chicago or Wisconsin. Many boaters will spend extended time up and down Michigan's west coast visiting all the port-towns. This could be the ultimate romantic getaway! Breakdowns, weather, or just needing fuel and supplies all have to be factored in your trip. 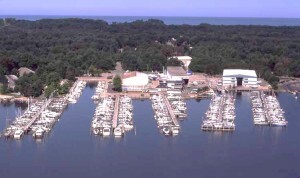 You can see how Lake Michigan Marinas play an important part of your boating trip plans. Many of these marinas are members of the Clean Marina Program which promotes environmental stewardship of Michigan's waterways. This program is growing and hopefully in the near future all the Lake Michigan Marinas will take part in this extremely important program. I recommend you look for the Clean Marina program signs and if you don't see them mention it to the marina owners or harbor masters. Please ... when boating on this magnificent body of water be a good stewart ... don't pollute. 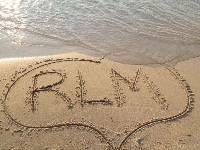 From Lake Michigan Marinas back to Romantic Lake Michigan home page.